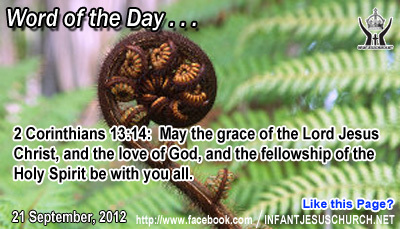 Heavenly Father, we are thinking of several valuable friends who need the richness of this blessing to fall upon them. Please bless them abundantly and graciously. In Infant Jesus' name we ask this. Amen. Today’s Gospel we see, Jesus saw Matthew sitting at his tax office – no doubt including his day's profit – Jesus spoke only two words – "follow me". Those two words distorted Matthew from a self-serving profiteer to a God-serving apostle who would fetch the treasures of God's kingdom to the poor and needy. When the Pharisees challenged Jesus' untraditional behavior in eating with public sinners, Jesus’ justification was quite simple. A doctor doesn’t need to visit healthy people; in its place he goes to those who are sick. Jesus similarly sought out those in the greatest need. A true physician looks for healing of the whole person – body, mind, and spirit. Jesus came as the divine physician and good shepherd to concern for his people and to restore them to entirety of life. The orthodox were so worried with their own practice of religion that they deserted to help the very people who needed spiritual care. Their religion was selfish since they didn’t want to have something to do with people not like themselves. Jesus stated his mission in clear terms: I came not to call the righteous, but to call sinners. Paradoxically the traditional were as needy as those they despised. All have sinned and fall short of the glory of God.